here in its second (and last) version, the YM2 of 1967-68, with its twin, the 250 YDS5. Two Peas in a Pod . In fact, only a difference of 5mm in the stroke distinguished the two versions, plus an important little accessory - the electric starter - standardized on the 250 in 1967. 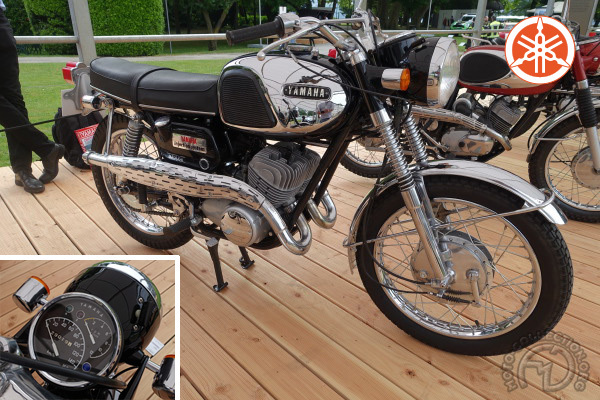 These two models were the last Yamaha twins with a vertical crankcase joint. They were replaced in 1968 by the 250 DS7 and a genuine 350, the YR2. of an extraordinary competition record. Between its first title in 1964 and 1973, Yamaha was six times world 250cc champion, of which four (and two second places) were won by Phil React Yamaha was also champion of France in 1966, 67 and 68. The only external difference between these two bikes was an electric starter on the 250, but they picked up the styling cues of the TD 1 C competition bike.